Oliver Taylor Hawkins (born February 17, 1972) is an American musician, best known as the drummer of the rock band Foo Fighters. Prior to joining the band in 1997, he was the touring drummer for Alanis Morissette as well as the drummer in a progressive experimental band called Sylvia. 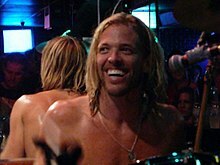 In 2004, Hawkins formed his own side project, Taylor Hawkins and the Coattail Riders, in which he plays drums and sings. He was voted "Best Rock Drummer" in 2005 by the UK drumming magazine Rhythm. Between 1995 and 1996, Hawkins was the drummer for Canadian musician Alanis Morissette for her Can't Not tour. He appeared in Morissette's videos for "You Oughta Know", "All I Really Want" and "You Learn". He also appeared on Morissette's VHS/DVD Jagged Little Pill, Live (1997). After touring through the spring of 1996, Foo Fighters entered a Seattle studio with producer Gil Norton to record its second album. Conflict reportedly erupted between Dave Grohl and drummer William Goldsmith, eventually causing Goldsmith to leave the band. The band regrouped in Los Angeles and almost completely re-recorded the album with Grohl on drums. The album, The Colour and the Shape, was released on May 20, 1997. Grohl called up Hawkins to recommend a new drummer, and to Grohl's surprise, Hawkins volunteered himself. He then auditioned for and subsequently joined the band, making his debut in time for the album's release. In addition to his drumming duties with the Foo Fighters, Hawkins is also an accomplished rock singer, guitarist and pianist. His first lead vocal with the group was a cover of Pink Floyd's "Have a Cigar". Two versions of the song were released, one as the b-side to "Learn to Fly" and another on the Mission: Impossible 2 soundtrack album. He sang lead vocals on the original "Cold Day in the Sun," from In Your Honor, which was later released as a single, and the cover of Cream's "I Feel Free," which appeared as the b-side of "DOA" and on the EP Five Songs and a Cover. Hawkins also sang lead vocals for the band's cover of Joe Walsh's "Life of Illusion." Most recently, he sang lead vocals for "Sunday Rain," a track on the Foo Fighters' 2017 album Concrete and Gold. Many Foo Fighters live shows feature Hawkins singing lead vocals on at least one cover song. In 2006, Hawkins released a self-titled LP with his side project, Taylor Hawkins and the Coattail Riders. He occasionally plays with a Police cover band alternately called "The Cops" and "Fallout." At Live Earth in 2007, Hawkins was part of SOS Allstars with Roger Taylor of Queen and Chad Smith of Red Hot Chili Peppers. Hawkins played "YYZ" with Geddy Lee and Alex Lifeson of Rush on stage at a concert in Toronto on March 22, 2008. Hawkins recorded the drum tracks for the Coheed and Cambria album Good Apollo, I'm Burning Star IV, Volume Two: No World for Tomorrow as the band's regular drummer, Chris Pennie, was not able to record due to contractual reasons. Also, Hawkins toured with Coheed and Cambria shortly during the months of the album. Hawkins can also be heard drumming on Eric Avery's (formerly of Jane's Addiction) first solo effort, Help Wanted and on Kerry Ellis's album, Wicked in Rock. Hawkins and Grohl split drumming duties on Harmony & Dissidence, the latest album by Foo Fighters bandmate Chris Shiflett's own side project, Jackson United. Hawkins recorded the drum for the track "Anche se," from Vasco Rossi's demo. Hawkins played on the track "Cyborg," from Queen guitarist Brian May's 1998 solo album, Another World; he also played drums at VH1's Rock Honors 2006 while Queen performed "We Will Rock You." He sang backing vocals on the Queen + Paul Rodgers single, "C-lebrity." Hawkins was commissioned to complete an unfinished recording of a song by Beach Boys' drummer Dennis Wilson titled "Holy Man" by writing and singing new lyrics. The recording was released in June 2008 as part of a deluxe edition of Wilson's lone 1977 solo album, Pacific Ocean Blue. While the Foo Fighters were on break, Hawkins played in a three-piece cover band, Chevy Metal, that played lesser known tracks by ZZ Top, Aerosmith, Deep Purple, Van Halen, Queen, and Black Sabbath. Hawkins continues to play in Chevy Metal, with the addition of fellow Foo Fighters bandmate Chris Shiflett now on guitar. Hawkins appears on Slash's solo album Slash, released in 2010, providing backing vocals on the track "Crucify the Dead," featuring Ozzy Osbourne. In 2011, Hawkins recorded drums for songs by Vasco Rossi. In June 2012, it was announced that Hawkins was cast in the role of Iggy Pop in the rock film CBGB. Hawkins recorded the drums on Vasco Rossi's last song, "L'uomo più semplice." This song was released on January 21. [year needed] in Italy. In March 2014, Hawkins announced his new side project called The Birds of Satan. It features Hawkins' drum technician and bandmate from Chevy Metal, Wiley Hodgden on bass guitar and vocals as well as guitarist Mick Murphy also of Chevy Metal. The band's self-titled debut album was released in April 2014, with a release party at 'Rock n Roll Pizza' featuring the Foo Fighters guesting on some of the cover tracks. Hawkins has said that his drumming has been chiefly influenced by classic rock drummers. His main influences are Phil Collins of Genesis, Stewart Copeland of The Police, Roger Taylor of Queen, Stephen Perkins of Jane's Addiction, Jim Gordon of Derek and the Dominos and Neil Peart of Rush. He was once guest editor of Rhythm and interviewed Collins, Copeland, Taylor and Perkins for the issue. It was thanks to Rush that I got into Genesis. After listening to Neil, I bought the Seconds Out live album, which was released in 1977. It's just amazing. Not only hearing Phil Collins playing the drums, but also singing. He gets a really bad rap from some people for 'daring' to take over after Peter Gabriel quit, but you just hear the way he sounds here. The beauty of this album is that it's got songs from …Trick Of The Tail, the first album Genesis did without Gabriel. Collins is an incredible drummer. Anyone who wants to be good on the drums should check him out – the man is a master. Hawkins and his wife, Alison Hawkins, have three children. Their son, Oliver Shane, was born in 2006; their daughter, Annabelle, was born in winter, 2009; and their second daughter, Everleigh, was born in November, 2014. They reside in Hidden Hills, California after moving from Topanga Canyon in 2012. He is a childhood friend of current Yes lead vocalist Jon Davison. Hawkins was the one who suggested Davison to Yes bassist Chris Squire even before the departure of replacement vocalist Benoit David. "Strangely enough, Jon's name came up when we started working with Benoit," Squire recalled. "In fact, my friend, Taylor Hawkins, had been telling me for years: 'If you ever need a replacement (singer), I know exactly the guy.'" ^ "Slash interview, ultimate-guitar.com, March 20, 2010". Ultimate-guitar.com. March 20, 2010. Archived from the original on May 8, 2012. Retrieved October 18, 2011. ^ Jason Newman (March 4, 2014). "Dave Grohl, Pat Smear to Guest on Foo Fighters' Taylor Hawkins New Band The Birds of Satan | Music News". Rolling Stone. Retrieved July 18, 2014. ^ a b c d e f "Drum Icon Interviews: Taylor Hawkins". MusicRadar. August 31, 2010. Retrieved August 10, 2014. ^ a b "Taylor Hawkins: My Prog Heroes". Prog. April 7, 2014. Retrieved August 21, 2015. ^ "Foo Fighters Taylor Hawkins says he thought his 2001 overdose was the end of the band". NME.com. Retrieved June 27, 2018. ^ "JonDavison". Glasshammer.com. Retrieved July 18, 2014. ^ Blistein, Jon (November 1, 2016). "Foo Fighters' Taylor Hawkins Preps Debut LP 'KOTA'". Rolling Stone. Retrieved November 1, 2016. Wikimedia Commons has media related to Taylor Hawkins.